I’m a bit shy to admit that I’d never ridden the whole of this stretch of the trail, but rather than get myself all ashamed about it, I decided to get excited that there are still parts of Baltimore I’ve not explored. 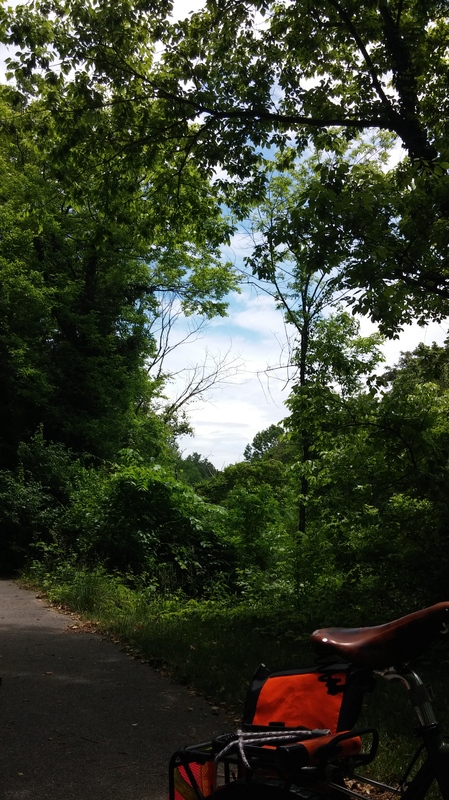 And this was a beautiful part–ridiculous overgrown greenery, the rat-a-tat of woodpeckers, squirrels racing onto and then off again the trail, sneaky lizards, other cyclists and runners, breezes, tiny insects that quickly plastered my sweaty chest as I pedaled quickly along. I snapped this picture of the sky through the trees when I stopped for a break at a park bench overlooking the water. The slight smell of sewage wafted my way–the smells of summertime. There were some muddy bits, but I just kept riding through them. Look where you want to go, not where you don’t want to go, my dad would say, and I did that, and I didn’t fall down, and then I was at the end of the trail. And not far from work. Welp, that’s what happens when you keep heading west, I guess. I rode a couple more miles on the streets looking for lunch and ended up at the grilled cheese place just before the on ramp to I695 in Catonsville. I ordered a grilled cheese, some shoestring fries, and a cold soda and settled in to get my energy back. I was so hot and sweaty and tired. It takes a few rides for me to get acclimated to the summer heat. I inhaled a second soda and thought about how much I wanted to text my dad to let him know the acclimation process is on, and that thought made me burst into tears over my sandwich. I choked them back, choked down the rest of the fries, and then got on my bike for the long ride home. I ran into SoWeBo Fest on my way back, stopped for water and chat with C., and then finished my ride home. Look where you want to go, not where you don’t want to go. This entry was posted in nature, parks, personal, weather and tagged Baltimore, Gwynns Falls Trail, SoWeBo Fest, summertime, West Baltimore. Bookmark the permalink.